Former Governor Ayodele Fayose has criticised President Muhammadu Buhari and the acting Chairman, Economic and Financial Crimes Commission, Mr Ibrahim Magu, for their refusal to investigate the Kano State Governor, Abdullahi Ganduje, over the bribes he allegedly collected from some contractors. Fayose said Buhari and the EFCC boss had not hidden it from Nigerians that they were hypocritical in their war against corruption. The former Ekiti State governor spoke through his media aide, Mr Lere Olayinka, in an interview with our correspondent in Lagos. Recently, video clips surfaced online, alleging that the Kano State governor collected bribes in hard currency from a contractor. Ganduje had, however, denied the allegations, describing the alleged bribery as the handiwork of mischief makers. But Fayose argued that Magu gave himself out with the way he answered questions on the issue put across to him by journalists during a press briefing last week. The ex-governor stated, “They will not do anything about the alleged bribery video. The last time the EFCC chairman addressed journalists, he was asked questions on the video and he parried the questions. He later said the matter was already in court and that the commission had not received any petition to investigate the allegation. “The question on the lips of everybody now is that who petitioned the EFCC before they started investigating some of those being investigated? 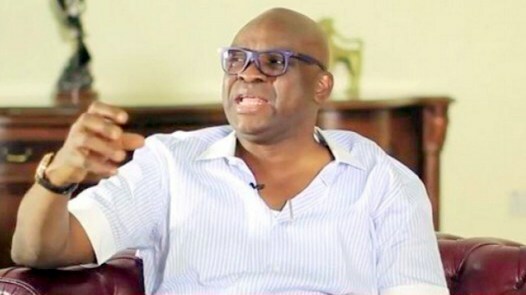 Fayose said the same government that had refused to investigate the alleged bribery against a governor on the platform of the APC despite the documentary evidence available would not hesitate to wage war against members of the opposition even without any allegation against them. He added, “In 2015, Buhari praised former Governor Rabiu Kwankwaso for transforming Kano State but the same Kwankwaso (now) is the one he openly accused of using public funds to fund presidential campaign. President Buhari went on to commend Ganduje; that he is a good governor and that the people love him. So, what do you expect from that kind of government? “They won’t investigate Ganduje. What have they done to Babachir Lawal, the popular grass cutter? What have they done to the NHIS boss? That one was suspended and Buhari had to reinstate him. What have they done to Abba Kyari despite so many allegations against him? If anybody thinks this government is fighting corruption, then that person needs to go back to sleep and wake up properly to know that he has been dreaming.